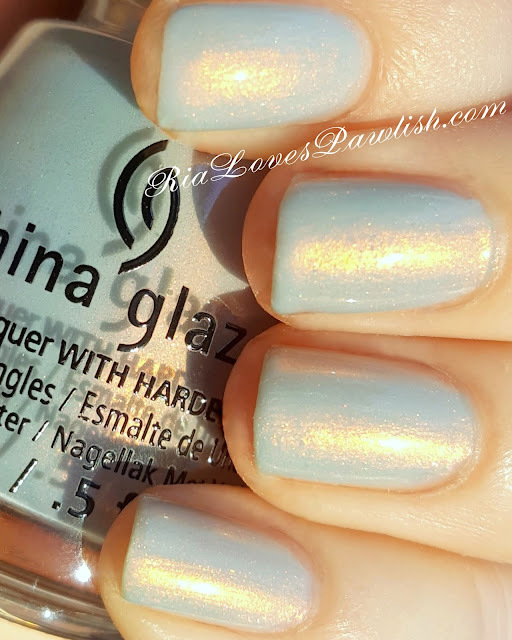 this Sunday i'm happy to be sharing Pearl Jammin' from the China Glaze Rebel collection! (press sample, kindly provided to me for review). Pearl Jam is one of my husband's fave bands... and this polish does not disappoint! it's a light blue shimmer with a strong warm pink reflex... in a word, yummy!! i thought it would be quite sheer, but it was super exciting to find out that you get full opacity in only two coats :D it doesn't dry glossy, so i highly recommend a high shine topcoat to bring out all those shimmers. two coats Pearl Jammin', finished off with one coat FingerPaints Fast Dry Top Coat. the China Glaze Rebel collection is available NOW :D here's where you can find it... this info is copied and pasted direct from China Glaze!